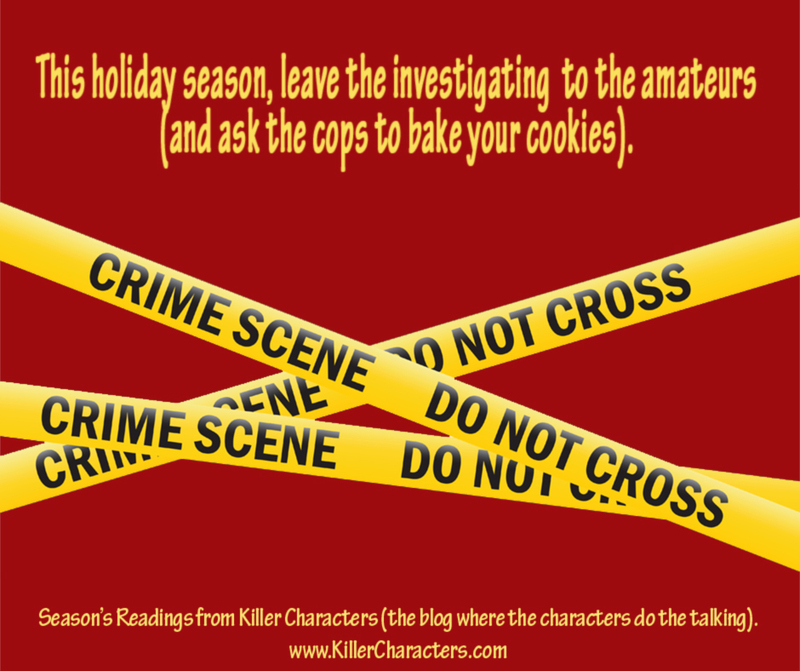 Killer Characters: Commit a murder? Me? 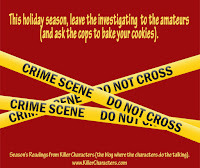 Join in with all of us at Killer Characters this month for our annual holiday giveaway - Season's Readings! 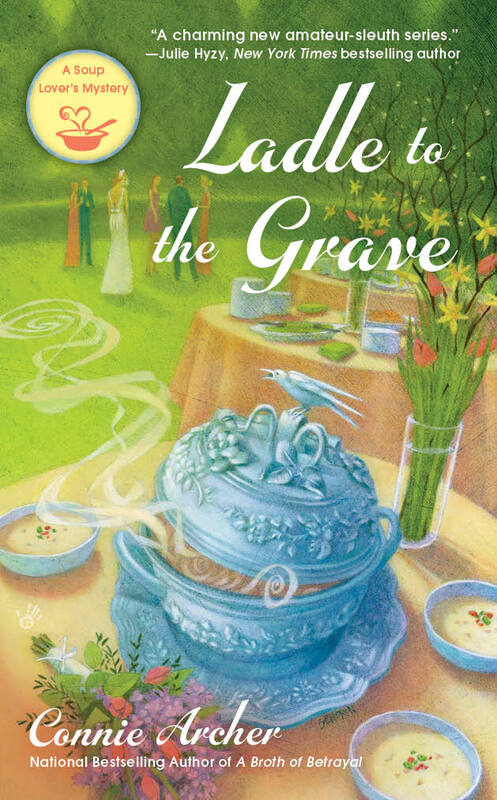 I'm giving away a copy of Ladle to the Grave today. (Or if you're a fan of the Soup Lover's Mysteries and have already read the latest, then please let me know your other choice.) Just leave a comment to win. My giveaway runs all day today, December 15th, and I'll announce the winner some time after midnight. Good luck everyone! Happy holidays and happy reading! I have no idea how I’m going to do this. Kill another human being. He said, “You have to do this. Otherwise, we’ll never be safe." I do agree with him, I know he’s right, but I don't know if I can actually go through with it. What we did years ago was a terrible thing, but what choice did we have? I thought by now she would have forgotten all about it, would have given up looking. But she hasn’t. She’s actually traced us here and found us and now there doesn’t seem to be a choice. But what if we're caught? What if the police figure it out? I certainly don’t want to go to jail. He says poison would be the best way. No one would ever figure it out. 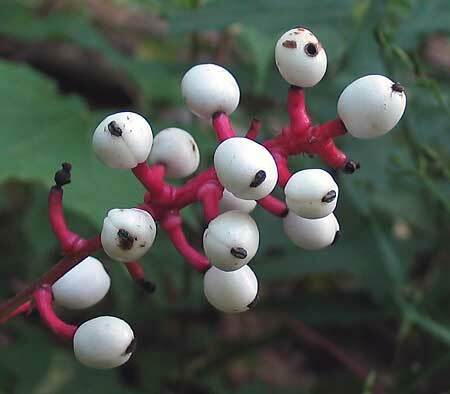 I know a lot about natural poisons and I know what to do. But can I do it? The ritual that’s planned in the woods would be perfect. I’ve volunteered to set everything up, so I know I’ll be able to arrange everything. I’m worried sick because I don’t know how I’ll feel afterwards. I wish I didn’t have to do this, but I can’t see another way. This is the most terrible thing I’ve ever had to deal with. I’m a good person, a kind person. I’ve never hurt anyone in my life. Well . . . just that time years ago, but I didn’t actually have to consider murder then. What should I do? Should I listen to him? Is there another way? I’m really terrified. I hope I can find a way . . .
You can read all about my dilemma in Ladle to the Grave. And don' t miss the upcoming adventures in Snowflake, Vermont in A Clue in the Stew (next April), available for pre-order now! 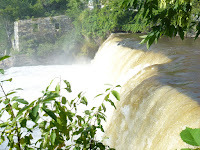 Visit Connie Archer on the web at Connie Archer Mysteries where you can sign up for her newsletter, at Facebook.com/ConnieArcherMysteries and Twitter @SnowflakeVT. I can't wait to keep reading! Thanks for the chance! Hi Karen - best of luck today! Don't forget, A Clue in the Stew will be out next April! Thanks for stopping by today! An exciting sneak peek thank you. Hi Mary - I'll bet it's warm for the holidays where you are! Thanks for stopping by and good luck! That's wonderful, Lisa. Thank you and glad you could visit today. Good luck! Hi Dawn - great to "see" you here today. Good luck in the giveaway! Oh thank you, Jody! I'm so glad you're enjoying all the crime in Snowflake. Best of luck in the giveaway! You're so welcome, Cheryl! I hope you get to visit Snowflake, VT soon. Good luck today! Happy Holidays, Connie! I have all the Soup Kitchen mysteries so no need to enter me in the contest. Just wanted to say can't wait for A Clue in the Stew! Hi Sally - Thanks for stopping by today, so nice to hear from you! Clue will be out in April, I hope you'll really enjoy it! Merry Christmas and a very happy New Year to you and yours! Soup is the best comfort food, isn't it? 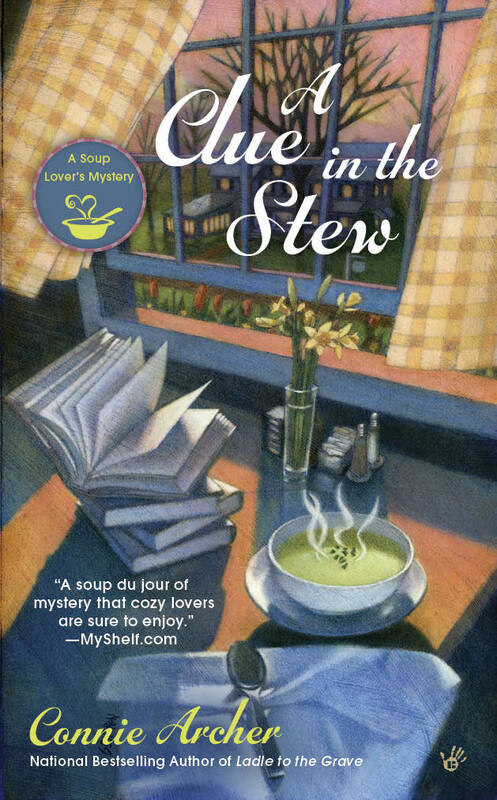 Nothing like a bowl of soup and a good mystery to get through the winter! Best of luck, LynMarie! Hi Gram - thanks for visiting today. Ladle to the Grave has a very interesting plot, I think. (even though I say so myself - LOL!). I hope you get to read it soon. Good luck today! I could use a book like this one. Sounds perfect. Hi Debby - Snowflake is a lovely village, even though the murder rate is a little high (LOL). Best of luck in the giveaway! Oh thank you, Bev! I hope you'll get to visit the village again very soon. Good luck today! You sure got me interested with that excerpt! I'll keep my fingers crossed that I win. That's great, Sue, so glad you could stop by today and best of luck! Della at deepotter@peoplepc.com. Intriguing teaser. Would love to be able to read the book. thanks for this opportunity. Hi Della - thanks for visiting today! Best of luck in the giveaway! Oh, thank you, what a lovely thing to say! I could totally live on soup, especially in the cold weather. There are some good recipes in Ladle to the Grave too. Lots of luck today! So glad you could stop by today! I hope you get to visit Snowflake again very soon. Best of luck! I'm so glad to hear you've enjoyed the books so far!!! The next one will be out next spring (A Clue in the Stew) but I wanted readers to have another chance to win a copy of Ladle before then. Good luck today! This series is on my to-be-read list and this winter is the perfect time to get them moved to my finished-and-loved-them list! That's wonderful, Lynne! I really hope you enjoy all the adventures in the village very soon. Best of luck today! would love to read this series, especially since the excerpt sounds incredible. What is going on in Snowflake? mlarkin at rmrgroup dot com. Hi Mary Louise - for a tiny New England village Snowflake has an incredibly high crime rate. I'm not sure why exactly because the regular characters are such NICE people, but at least all the murders keep readers interested. At least I hope they do. Best of luck today! Not the most rational thinking there. I have to agree with you there, Libby. But the poor thing is so overwhelmed, oppressed and bullied. I think you'll be surprised at what she finally does. Thanks for stopping by today and lots of luck! Thanks for the chance to win!! Love all the books on this site!! Happy holidays!! You too, Linda! I'm really glad we're all doing this holiday giveaway. And I'm thrilled to be part of Killer Characters too. Wishing you lots of luck today! Definitely an add to my TBR list! Oh, I hope you get to visit Snowflake, VT very soon, in spite of the high crime rate (LOL)! Happy reading and best of luck today! Sounds interesting. I have to visit Snowflake! Hi Dee - I think you'd enjoy Snowflake! Best of luck in the giveaway! Love the name Snowflake! Merry Christmas. Merry Christmas to you too, Karen! It really does snow a lot in Snowflake in the winter. Best of luck in the giveaway! I hope you get to enjoy the mysteries and crimes in Snowflake, VT soon, Nicole. Best of luck in the giveaway! This has piqued my interest. I wonder what she is going to do. Snowflake sounds like a nice town. Thanks for the chance to win! Hi Abby, I think you'll be surprised by what she does! You'll have to read all the way to the end though. Can't say more, it would be a spoiler! Good luck! Thanks for a chance to win. Snowflake sounds wonderful. Hi Babe - I hope you get to visit the village soon and meet all the characters there. Lots of luck in the giveaway! According to Goodreads, I've only been to Snowflake once. It's time to get back there. Enjoy your trip, Elaine! I think you'll have fun! Good luck! Hi Elaine - if you see this reply, please send me your email at conniearchermysteries@gmail.com, or post it with a new comment. Thank you. No worries though, you're still on the list. I would love to win the first book in the Soup Lover's series! Thank you for the chance. Merry Christmas and Happy New Year Connie! Merry Christmas to you too! Happy New Year and happy reading. A Spoonful of Murder it is, good luck in the giveaway! I just realized you didn't leave your email. If you see this, just post another comment. No worries though, you're still in the running. I already have this book and two others, so I'd pick A Broth of Betrayal if I won. I like the title A Clue in the Stew. Hi Michelle - best of luck and A Broth of Betrayal it is! Thanks for stopping by today! I already have four of the books in this series and highly recommend them. Would like to wait for "A Clue in the Stew" if possible. Merry Christmas and Happy New Year. Hi Dianne - thank you! Of course, if you're the winner I'd be very happy to send you an early author copy of A Clue in the Stew. Very best of luck in the giveaway! Hmmm . . . I'm not sure. Might be a good idea not to make any soups with your favorite plants though! Best of luck in the giveaway and thanks for stopping by today! I love this Connie Archer series. Oh thank you, Annette! Best of luck in the giveaway and I'm happy to send any of the (almost) five books to the winner. Happy reading! I love this series and have all the current ones. I would love to win the newest one! A Clue in the Stew sounds great! Oh thank you, Elaine! I'd be happy to send you an early author copy of A Clue in the Stew! Best of luck! Hi Robin, that's no problem at all. I can send you a copy when available, usually just before its release. I appreciate your offer very much and I'm happy to do so. You can send me your mailing address at conniearchermysteries@gmail.com. Good luck in the giveaway! I'll make a note about Broth too! Oh I'm sorry it arrived so late, but you're on the list, no worries! Best of luck in the giveaway! Hi Georgia - I use random.org to pick a winner, so it really makes no difference how many have entered, you stand as good a chance as any. I'll note A Broth of Betrayal for you. Good luck! Hi Barbara - glad you liked it! LOL! Best of luck in the giveaway! Hi Lexie - thank you and Merry Christmas to you too! I'll note Ladle to the Grave for you. Good luck! My December 15th giveaway has ended and using random.org, the winner is: "traveler" at s_____b@gmail.com. Thanks to everyone who entered. Happy holidays and happy reading! My favorite decorations are a bunch of stuffed animals figures we set around the house. I have reindeer, bears, multiple Santas and Mrs. Claus, even a skunk. All are in Christmas garb and most play some holiday songs. The grandkids love rearranging them all over the place.